I am happy to call Michael Hernon a highly respected friend. He is also a successful husband and father of TEN! 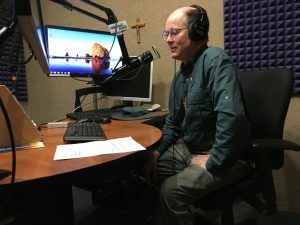 And yes, he has a great sense of humor, a lovely wife — and a great podcast for Catholic families — practical, biblical, funny, Catholic and easy to listen to. He and his wife share their wisdom, advice and practical suggestions they learn on the fly. It must be excellent, eh, if it has thousands of faithful subscribers! So, check it out. It is called Messy Parenting. Some of the latest topics are: Evangelizing Your Kids, Keeping Your Love Alive, Discipling and Disciplining Your Teens Part 1 and 2, Forgiveness, Family History and much more. Is Islam a Religion of Peace? A Profound Short Video from a Brilliant Muslim Women! I suggest everyone listen/watch this short video. She puts it all in perspective in a few minutes. Pass this on to others. We need to wake up! Was Abraham Save by Faith Alone? See the Interactive Map, Itinerary and more HERE. For more information or to register, contact Elizabeth at emarkey@ctscentral.net or (313) 744-2530 or toll-free 1-800-727-1999, ext.150. In the 1850’s – “Pro-slavery” or “Pro-Choice”? “Many in the 1850’s also considered themselves “pro-choice” rather than “pro-slavery”. History repeats itself…” (Obianuju Ekeocha Twitter@obianuju) In other words, I am personally against slavery, but I think people (or the states) should have the freedom to choose. A visit to the Chaldean Christian town of Karemlash, 9 miles from Mosul, liberated from ISIS by Iraqi and Kurdish forces in November 2016. I sure hope and pray the world wakes up and stops this carnage. I am glad President Trump has promised – and is doing something already to end this. ANNOUNCING: Saints & Shrines of Italy: One of a kind Pilgrimage! Was Joseph the Father of Jesus? Video of Going to Work with Jesus and Joseph near Nazareth!